The relationship between the NPP of a wide range of ecosystems on the Tibetan Plateau and both precipitation and temperature is illustrated in Figure 17.9. Water is an essential resource both as a constituent of cells and for photosynthesis. Large quantities of water are lost in transpiration - particularly because the stomata need to be open for much of the time for CO2 to enter. It is not surprising that the rainfall of a region is quite closely correlated with its productivity. In arid regions, there is an approximately linear increase in NPP with increase in precipitation, but in the more humid forest climates there is a plateau beyond which productivity does not continue to rise. Note that a large amount of precipitation is not necessarily equivalent to a large amount of water available for plants; all water in excess of field capacity will drain away if it can. 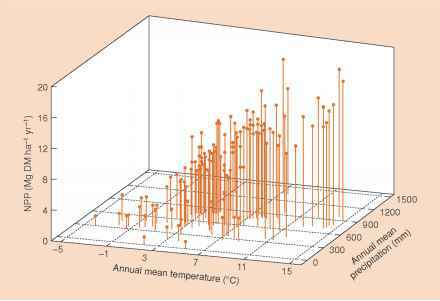 A positive relationship between productivity and mean annual temperature can also be seen in Figure 17.9. However, the pattern can be expected to be complex because, for example, higher temperatures are associated with rapid water loss through evapotranspiration; water shortage may then become limiting more quickly. the slopes of the relationships differed between the two environmental gradients (Figure 17.10a). 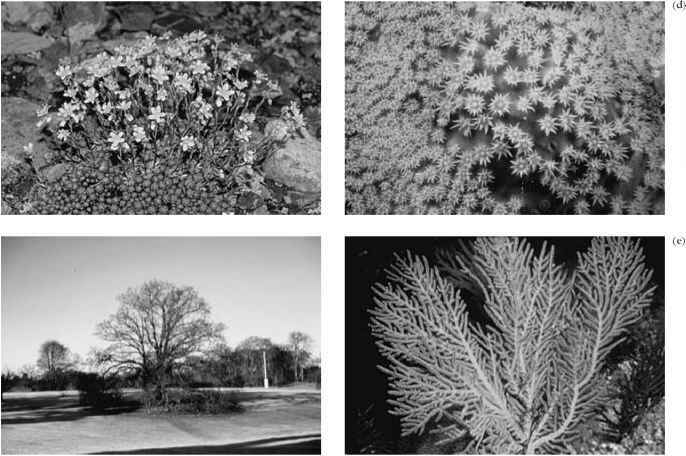 growing season and a negative effect through increased évapotranspiration at higher temperatures. Because temperature is the main constraint on productivity at the cool end of the gradients, an increase in NPP is observed as we move from the coolest to warmer sites. However, there is a temperature value above which the growing season does not lengthen and the dominating effect of increasing temperature is now to increase evapotranspiration, thus reducing water availability and curtailing NPP (Epstein et al., 1997). Water shortage has direct effects productivity and on the rate of plant growth but also the structure of leads to the development of less dense the canopy vegetation. Vegetation that is sparse intercepts less light (much of which falls on bare ground). This wastage of solar radiation is the main cause of the low productivity in many arid areas, rather than the reduced photosynthetic rate of drought-affected plants. This point is made by comparing the productivity per unit weight of leafbiomass instead of per unit area of ground for the studies shown in Figure 17.8. Coniferous forest produced 1.64 g g-1 year-1, deciduous forest 2.22 g g-1 year-1 and desert 2.33 g g-1 year-1. Why water and temperature are critical factors for NPP? Why water and temperature are critical factor for NPP?